We’re headed east on I-84, out of Portland. We have two convenient ways to join the Historic Columbia River Highway, traveling east. Exit 17 will take us through Troutdale, across the Sandy River, through Dabney State Park, and up through Corbett before we get to Vista House. Alternatively, Exit 22 on I-84, another 5 miles up the freeway, will eliminate the Troutdale section. Troutdale is the official Gateway to the Columbia Gorge. This route will take us through Glen Otto Park and the Sandy River. Troutdale was named by pioneer John Harlow for the trout pond in a dale near his house. Troutdale is also the home of the 38-acre McMenamins Edgefield (map), formerly the Multnomah County Poor Farm. The site has a hotel and a variety of restaurants, bars, and entertainment venues. A good jumping off place. Glenn Otto Park is a popular place to picnic, hang out on the beach, or raft down the Sandy River. It’s east of Troutdale a few miles. Our Historic Highway route follows The Sandy River and heads up the hill towards Corbett. Dabney State Park is a popular spot for fishing, boating, rafting, tubing, picnicking, bird watching, nature walks and biking. Google maps shows several bike routes to Vista House. 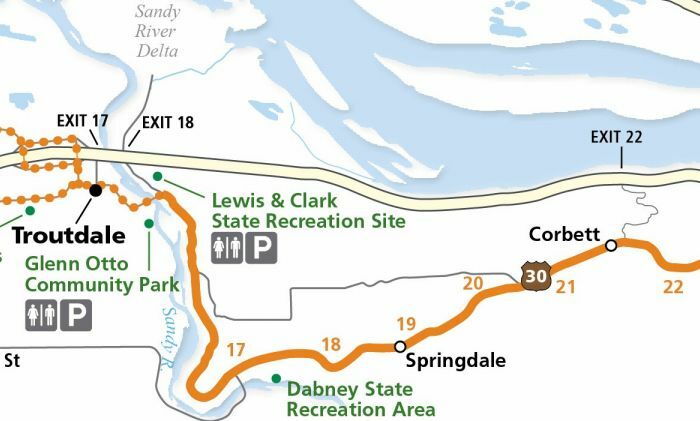 The route past Dabney State Park and Bell Road follows the Sandy River a bit longer but takes about the same amount of time. The small town of Corbett connects with I-84 (exit 22). We’ll continue up the highway. On the next page, we’ll take the alternative Exit from I-84 (Exit 22), which rejoins our current location. In 1986, the Columbia River Gorge became the first National Scenic Area in the United States.